Want your sci-fi stories with a new twist? On occasion, the dimensional barriers between realities weaken. In those instances, you might catch a glimpse of different places and times. Welcome to Never Wake. 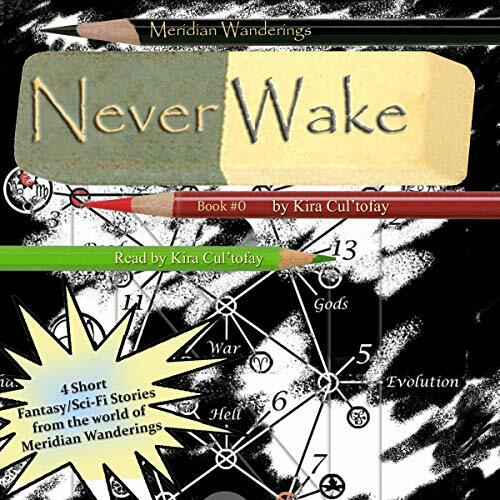 Never Wake offers four short stories from the Meridian Wanderings universe. Wonderfully penned prequel fables, Never Wake is the perfect place for fantasy and sci-fi fans to jump on or for long-time Meridian Wanderings fans to learn of tales from long ago. Authored by series creator Kira Cul'tofay, Never Wake combines the exuberance of youthful fun with a more adult flair. These grown-up fables of love, loss, fear, and laughs are brought to life for those who remember what childhood bedtime stories should be like. I really liked all of the stories. In particular High Hoax with Fosby. This story had me laughing out loud several times and you have to wonder if there isn't a bit of truth in Xsoti (Sasquatch) being stoners. How else do they put up with us. I think the story Castle and Tide is a good example that you shouldn't blow off little kids just because you don't believe their stories.